The radio team of a North Vietnamese attack group photographed during the offensive on the city of Quang Tri in 1970. An explosion has just gone off in the background, and three troops advance through the smoke. A soldier takes aim to provide covering fire, while the two men in the foreground, with stoic concentration on their faces, attempt to use the radio amid the chaos of battle. When Quang Tri was still the South’s border with North Vietnam, it suffered a major attack in the January 1968 Tet Offensive, when Communist troops briefly occupied the provincial capital, Quang Tri City. Later, in 1972, the city was again captured by North Vietnamese forces, although this occupation was also short-lived. Finally in 1975, the entire province fell following the last North Vietnamese offensive of the war. The North Vietnamese Provisional Revolutionary Government laid claim to the province: collective farms were put in place and strict rules were enforced on the villagers, many of whom eventually fled. The Vietnam War provided the most extensive access to battlefields for journalists and photographers. But it was the work of American, British, and French photojournalists that was viewed all over the world. What was happening on the other side of the Hill? These previously unpublished pictures reveal how the war was captured by North Vietnamese photographers, Doan Cong Tinh, Mai Nam, Hua Kiem. ‘Western photographers wanted to show the horror of the war, and wanted to stop it. But these ones wanted to prove that they could defeat the Americans, that they could win the war,’ says photographer Patrick Chauvel, the man who brought the images to light. The authors of these photographs were also soldiers, their aim was to provide positive information on the progress of their struggle. Thus the images portray citizen soldiers – the very young and the very old, male and female, peasant combatants fighting side by side. Here are heroic female fighters wearing straw hats instead of helmets, and smiling North Vietnamese soldiers reading letters from home, rather than shell-shocked grunts, frightened US soldiers surrendering and, ultimately, the debris left by the defeated enemy. Nguyen Thi Hien, 19-year-old head of the militia squad in Yen Vuc (Ham Rong district, Thanh Hoa province), survived more than 800 air-raids, and was buried alive four times in B-52 bomber attacks. North Vietnamese scouts attempt to make a passage through rapids for the logistics units that are behind them with supplies of food and munitions. After the Paris Peace Accords were signed on 27 January 1973, the greatest exchange of prisoners in the Vietnam War took place in the spring of 1973, near Thach Han River (Quang Tri province). Here the North Vietnamese prisoners released by the South Vietnamese are running towards their comrades-in-arms. South Vietnamese flags can be seen flying in the background. 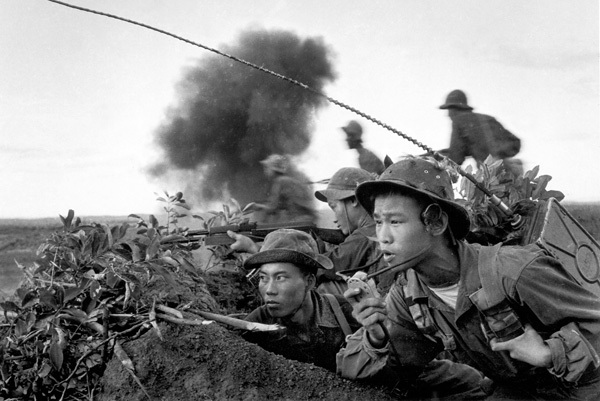 North Vietnamese assault troops on the offensive. This article was featured in issue 50 of Military History Monthly.